This week (July 15-19, 2013) the Canadian media has been awash with stories about malnourishment of Aboriginal (“Indian”) children in nutrition experiments carried out from 1948 to 1952. The source of the media’s information is an article by historian Ian Mosby, “Administering Colonial Science: Nutrition Research and Human Biomedical Experimentation in Aboriginal Communities and Residential Schools, 1942-1952” (Histoire Sociale/Social History, vol. 46, no. 91, May 2013, pp. 145-172; http://www.ianmosby.ca/about/ ). Mosby recounts experiments in Indian residential schools from 1948-52 that would violate today’s ethical standards. In an attempt to improve Indian children’s nutritional status, researchers gave experimental nutritional supplements to some children in some schools, but left other students and schools without such supplements, as “control” groups. They also denied some children dental care in order to observe the effects of malnourishment on the children’s teeth and gums. The larger story behind these experiments, as Mosby makes clear in his article, is severe malnutrition among Canada’s Aboriginal populations in the 1930s and 40s. According to Mosby, the children who were the subjects of these experiments were already malnourished in the residential schools where they were forced by the government to live, with little if any contact with their parents or other Aboriginal adults. The experimenters who left some “control” children malnourished while feeding others experimental nutritional supplements were trying to find ways to improve Aboriginal peoples’ diets without addressing long-term, structural problems. These structural problems included erosion of Aboriginal people’s traditional diets and inadequate funding both of schools and Aboriginal reserves by the relevant national government departments. The economist and philosopher, Amartya Sen, has famously suggested that “there has never been a famine in a functioning multiparty democracy” (see his Development as Freedom, 1999, p. 178). The reasons for this, Sen argued, are that in democracies citizens have access to a free press, they are allowed to criticize their governments, and they can vote their governments out of office. But Aboriginal Canadians did not have these rights in Canada at the time that they were suffering from severe malnutrition. Indeed, if you were recognized as a “status Indian” and lived on a reserve, you couldn’t simultaneously be a citizen with the right to vote in federal elections until 1960. The government also restricted Aboriginal Canadians’ rights to freedom of association. And of course, Aboriginal children had no rights at all. Those who lived in residential schools were effectively prisoners in “total institutions,” institutions where the inmates were totally controlled by those in authority. Total institutions of this kind—residential schools, prisons, orphanages, homes for the disabled—are notorious in Canada for abuse of the inmates; over the last 30 years Canadians have heard horrific story after horrific story about these places, often, like Indian residential schools, run by various Christian denominations. 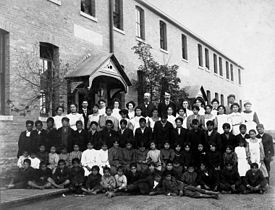 Aboriginal children were torn from their families, who in turn had no say over how their children were treated in residential schools, whose notorious purpose was to “take the Indian out of the child.” And the children knew that if they complained about their hunger, there would be “consequences,” as one survivor of the residential school system said on the radio. This survivor was so hungry that he used to go into the woods with his friends after school and hunt for small birds to eat. When I heard him say this, I thought of what I’ve been learning recently about state-induced famine in North Korea in the 1990s. There, if you foraged for food, you ran the risk of execution. At least things weren’t that bad in Canada, but Aboriginal children did go hungry for years on end, afraid to say anything to their “caretakers” for fear of brutal punishment. Ironically, the reports of Ian Mosby’s article broke in Canadian newspapers just as Canada’s Truth and Reconciliation Commission is trying to find out the truth about white Canada’s relations with Aboriginal people, and in acknowledging that truth to come to some form of reconciliation between the two groups. Yet at the same time, the Commission is having trouble getting access to all the government’s records of how it has, historically, treated Aboriginal people. Now we know why. Not surprisingly, Canada’s Aboriginal leaders are demanding an apology from the government for these nutritional experiments. But that is not enough. Every living survivor of this experiment deserves substantial financial reparation. And I think those survivors’ children and grandchildren deserve apologies and reparations too, as the long-term effects of malnourishment may well have reduced the survivors’ abilities to make a living and support their descendants. The American legal scholar David Marcus coined the term “faminogenesis” in 2003 to refer to state activities “creating or aiding in the creation of famine.” He described four degrees of faminogenic behavior. These four degrees are intentional famine, using famine as means of extermination; reckless famine, continuing policies despite evidence of famine; famine by indifference, turning a blind eye to mass hunger; and famine as a consequence of incompetence (see David Marcus, “Famine Crimes in International Law,” American Journal of International Law, vol. 97,no, 2, 2003, pp. 245-81). Canada didn’t create famine, but it did recklessly contribute to the malnourishment of Aboriginal children and adults, in its overall policy of underfunding reserves and schools and in the experimenters’ decision to leave some children malnourished in the interests of “scientific” rigor. The experimenters could easily have fed the children they were studying enough food, but they didn’t; they were indifferent to the children’s suffering. If anyone who conducted these experiments in the 1940s and 50s is still alive today, he or she should be held accountable, as should the federal government. This is one week that I am truly ashamed to be a Canadian. Very good points you wrote here..Great stuff...I you've made some truly interesting points.Keep up the good work.